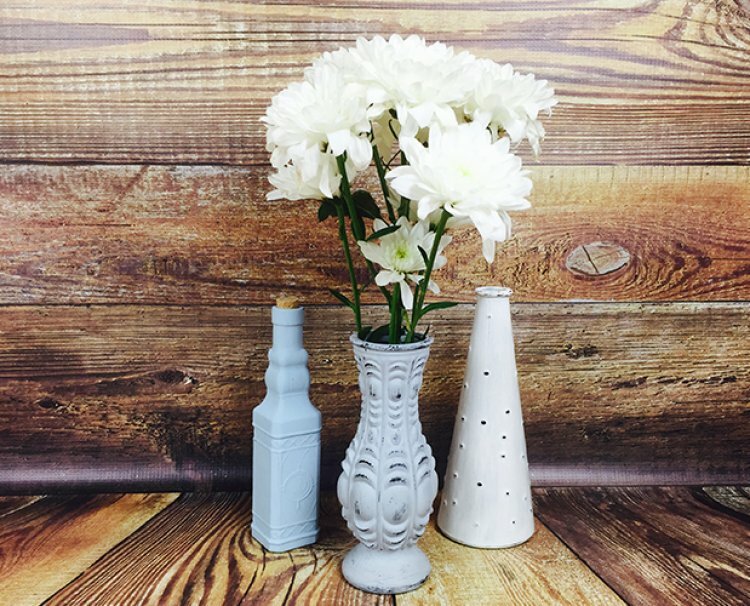 Milk bottles, wine bottles, old vases and much more can be upcycled to make new features in your home. You won’t throw away anything without considering what you can make ever again! To create a vintage look, using a dark shade of Chalky Finish Paint for glass and paint your glass. For this glass bottle, we have used the relic colour paint and we have also painted the inside of the bottle head. After the paint has dried, paint again with a lighter shade such as the yesteryear paint. The Chalky Finish Paint for Glass is thick so you should only need to apply one layer of colour. Once dry, use a small piece of sandpaper to remove some of the paint from the bottle, this will give the bottle a distressed effect. When upcycling, textured glass bottles are great for creating a unique look using different colours. We picked this spotted glass bottle to demonstrate this. Cover the bottle with a dark paint and leave to dry. Once completely dry, add a top coat using a lighter colour. Use a small piece of sandpaper to remove the lighter paint from the spotted texture of the bottle. As an alternative you can add some sparkle to textured bottles by adding glitter to the risen shapes on the bottle. We have picked this detailed glass bottle to upcycle because the Serene Chalky Finish for Glass paint really enhances the unique shape and decorative pattern on the bottle. This upcycled bottle would look fabulous on your mantel piece or coffee table. Have we inspired your bank holiday weekend crafts? We would love to see what you have made! Just share your latest creations in the project gallery.